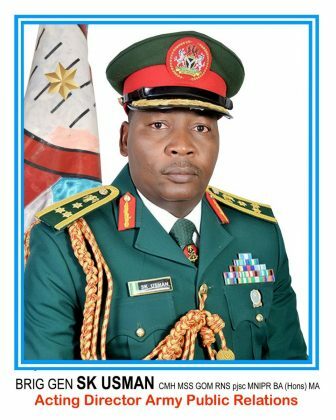 SK Usman, Abuja: The Nigerian Army Council has today Monday 20th November 2017, approved the promotion of 45 Brigadier Generals to the rank of Major Generals and 92 Colonels to the rank of Brigadier Generals respectively. Some of those promoted to the rank of Two Star Generals (Major Generals) include Brigadier General HO Otiki, Acting Commander Defence Headquarters Garrison, Brigadier General OO Soleye, Acting Director Veteran Affairs, Defence Headquarters, the Acting Provost Marshal, Brigadier General AT Hamman, the Acting Military Secretary, Brigadier General F Yahaya, the Acting General Officers Commanding 3, 7 and 8 Divisions, Brigadier General BA Ahanotu, Brigadier General IM Yusuf and Brigadier General SO Olabanji respectively, Acting Commander Nigerian Army Ordnance Corps Brigadier General JI Unuigbe, Brigadier General AA Jidda, Acting Commander Nigerian Army Corps of Supply and Transport, Acting Chief of Accounts and Budget (Army), Brigadier General JE Jakko, Commandant, Depot Nigerian Army, Brigadier General VO Ezugwu and Brigadier General ACC Agundu, Director, Foreign Liaison, Defence Intelligence Agency, Acting Commander, Headquarters Command Army Records, Brigadier General HE Ayamasaowei and Brigadier General MS Yusuf, Commander Guards Brigade, while late Brigadier General BA Raji, was promoted posthumously. Similarly, Brigadier General OF Azinta, Commandant Martin Luther Agwai International Leadership and Peacekeeping Centre and the Commandant Nigerian Army School Infantry, Brigadier General J Sarham, Brigadier General TA Gagariga, Commander Nigerian Army School of Artillery and Brigadier General LF Abdullahi, the Acting Commander Nigerian Army Education Corps have also been promoted Major Generals, as well as Brigadier General JGK Myam, Acting Director Operations and Brigadier General US Yakubu, Acting Director Peacekeeping Operations, amongst others. While those elevated to the rank of One Star Generals (Brigadier Generals) includes Colonel A Israel, Colonel COC Ekulide of Defence Headquarters, Colonel SOF Olowolayemo, Colonel JTE Chukwu, Colonel EE Eyong and the prolific writer, Colonel DC Nengite, as well as Colonel CA Dalhatu and Colonel UN Babangida. Others include Colonels UI Mohammed, Colonel NU Mukhtar, Colonel OG Onubogu, Colonel ST Shafaru, Colonel GG Shipi, Colonel AS Ishaq of 8 Division Provost Group, Colonel AOI Kalajaiye, Colonel JC Mbibi, Colonel HA Gambo and Colonel LB Mohammed, amongst others.